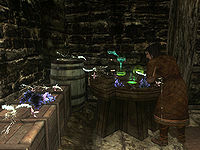 Ingun Black-Briar is an aspiring Nord alchemist living in Riften. She is the daughter of Hemming Black-Briar and sister of Sibbi. Maven Black-Briar is her grandmother. She spends nearly every day training in Elgrim's Elixirs only to return home to sleep and eat meals. She needs help finding some alchemy ingredients; helping her out will reward you with leveled gold and a key to a storage chest that refills with some random leveled potions every few days. Also, if she is befriended, you can sleep in her bed. 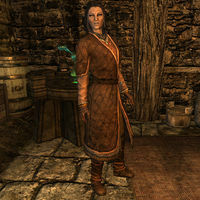 Ingun's father, Hemming Black-Briar can be heard talking about Ingun's lack of interest in family business as well, saying things like "My children, Sibbi and Ingun, are being groomed to run the family business one day as well. ", "Sibbi will prove to be a fine leader one day, but Ingun... that girl has her mind somewhere other than business." and "Maven's disappointed that Ingun's heart isn't in the family business, but she says 'Ingun still has her uses.' Not sure what that means." Some dialogue incorrectly identifies Maven as Ingun's mother rather than her grandmother. Esta página foi modificada pela última vez à(s) 11h33min de 30 de dezembro de 2013.